2015 - U.S.A., Canada, Sweden, Norway, Denmark, Netherlands, Belgium, U.K., Ireland, Australia, and New Zealand! 2016 - U.S.A. ... and more? mellow weasel wrote: You mean even if your parents went with you, you still couldn't go? What the hell? Is Hard Rock Orlando in there?? I keep trying to spot it but can't identify! Gahhh ;. ; if only my memory was more vivid of the 'Tacky' performance to recognize either the stage, or the way he came in! Ai to warai no! SAILOR POLKA ☆ MOON! Tsuki ni kawatte-- tanoshi mazettangeru! Looks like they did the whole Mandatory set list at the Enmore, its up on set list fm. A couple of the Australia shows were full sets at least. The festival sets looked alright but, weird not seeing any medleys in a Weird Al set. Yankomaniac wrote: Looks like they did the whole Mandatory set list at the Enmore, its up on set list fm. Almost. We didn't get Wanna B Ur Lovr, probably because it was a standing show. I have a question, so I'm really nervous that i'm not gonna be able to get tickets to another Al concert, because I always hear people say that you have to buy them super fast or they sell out..? Now, the show I went to was a show that was added later on, so that might be why I managed to get tickets so late. But I'm a bit concerned. How fast to the tickets usually sell out? It depends on the how much love that particular city has for Al, I guess. It varies wildly. I'm wondering if there is going to be anything like the Czar experience on this leg of the tour. Me thinks I may go for it this leg of the tour just so I can meet Al and get something off my bucket list. Al has reminded us that in 2016 it' is still Mandatory. 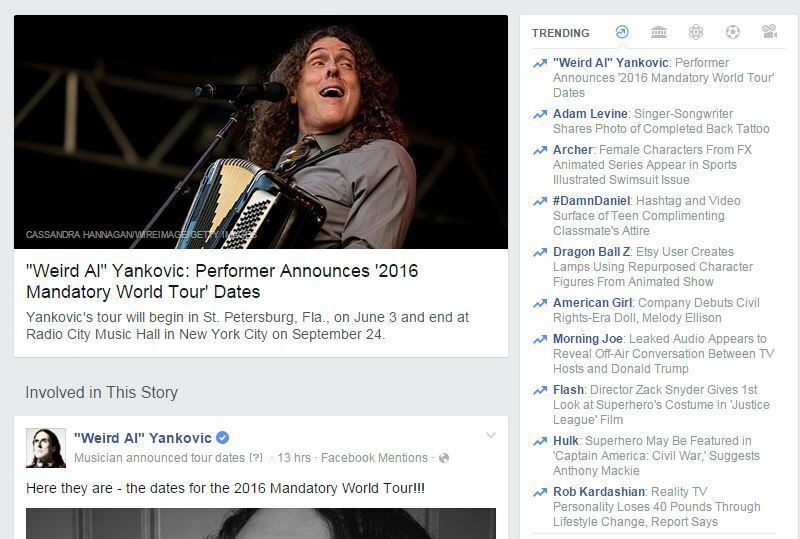 Not sure if this is an actual trending news story or if it's just because Facebook knows I'm addicted to Weird Al, but this is a thing!